Apples HomePod will be launched in the United States, United Kingdom and Australia in December 2017 and it will be launched in other markets in 2018. Apple has unveiled its HomePod with Siri speakers to compete with the existing devices. Apple revealed the HomePod at the annual worldwide developer conference. Apples’ CEO while announcing HomePod said that “there are companies who are making products to enjoy music at home but none of them have nailed it yet”. Apples HomePod has combined the features of all the devices and has built a device with the most notable and unique features. Related: iPhone 7 and seven plus features and reasons to buy. Its small vase like case carries seven tweeters and four inch woofer that explains the emphasis on the audio quality of home speakers. Just like iPhone, Apples HomePod is powered by A8 processor. It comes in white and space grey. It also features the real-time acoustic modeling spatial awareness allowing it to squeeze music that goes with the environment and acclimates the output automatically with the breakthrough home speaker that’s designed to rock the house. Siri can be accessed with HomePod by giving voice commands. But on HomePod Siri is also a musicologist rather than just a virtual assistant that will help you in finding new tunes at Apple music. Apples HomePod is controlled by using Siri. It is a voice activated personal assistant which according to Apple is well trained to answer questions about music like “hey Siri, who is playing drum in this song?” and “who is playing guitar in this song?” Not only can you ask questions to Siri but instead these Siri speakers also mark your favorites and remember your choices. This is another notable feature of Apple HomePod. HomePod is a category where apple is a little late to develop the smart speakers. In the past few years Alexa ecosystem and Amazon’s Echo has already grown progressively. On the other hand Google has also launched its Home speaker and assistant. And Microsoft also has a leg up with Harman Kardon Invoke speaker. Despite of the fact that competitors’ products are working well in the market, apple has launched the HomePod smart speakers on the ground that as usual they are delivering the exceptional audio experience than the competitors. Apple is also targeting Sonos which signals that the audio quality of HomePod is better than what we get from Google and Amazon. Apples’ HomePod price will be expensive than Google Home and Amazon Echo but cheaper than Sonos Play 5. Previously Apple reinvented portable music by introducing iPod to the world and now HomePod will again reinvent the way music is enjoyed wirelessly at our homes. 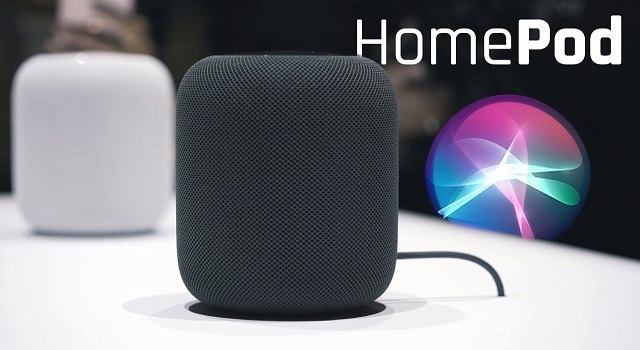 Not only HomePod is used solely for enjoying music instead this device can also be used for sending messages, get news updates, latest weather reports, sports news and it can also control other smart home devices that are connected using Apples’ HomeKit. Apples HomePod will be launched in the United States, United Kingdom and Australia in December 2017 and it will be launched in other markets in 2018. Apples HomePod seems to stake out markets high end devices with its technology, positioning and price.